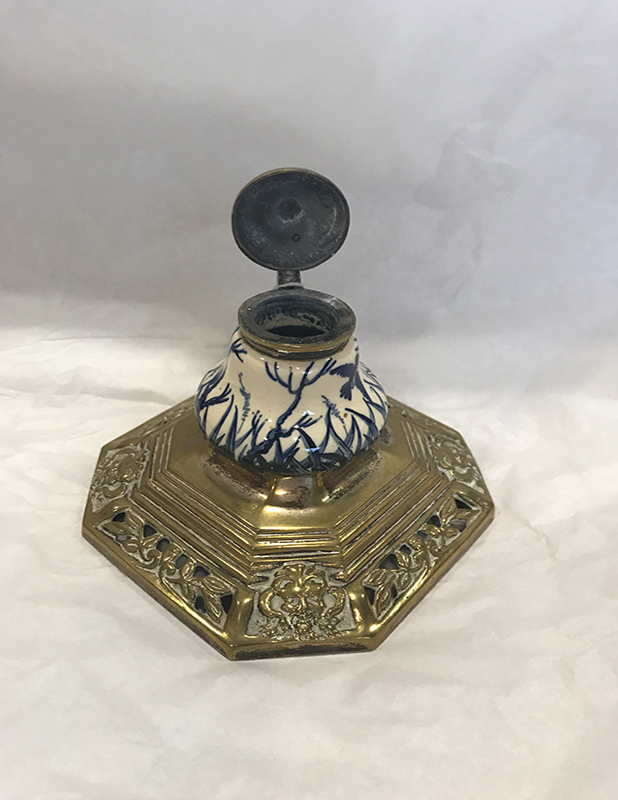 A ceramic inkpot, mounted in a brass stand, with brass top. No inscription. We have not been able to verify the story, and would appreciate any images of the signing ceremony, that would help us verify the claim. 11th Bn RWF was serving in that theatre, during the signing of the Armistice. 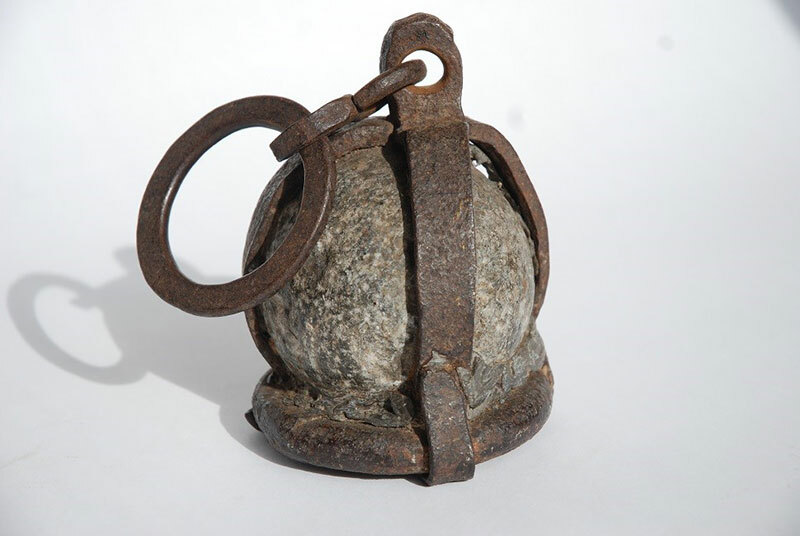 A 16th Century stone cannon ball enclosed in an iron frame with a large iron ring attached. 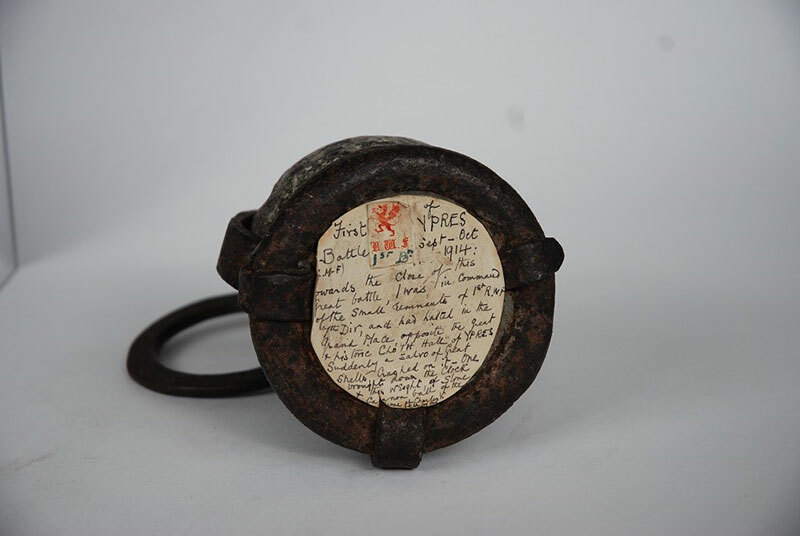 This object was recovered during an enemy shelling, from outside The Cloth Hall at Ypres, by Captain JR Minshull-Ford, in early November 1914 as the First Battle of Ypres was drawing to a close. It may have been previously used at the Cloth Hall as a clock weight. By the 31st October 1914, 1RWF had been effectively wiped out. From an initial strength of over 1000 men, now just a few dozens of the rankers and only one officer were left. Reinforcements started to arrive. One group on the 9th November included Capt. Minshull-Ford, as well as Major REP Gabbett and ninety-nine Other Ranks. To the base of the cannon ball, Capt. Minshull-Ford later attached a handwritten label explaining how he came to acquire the object. 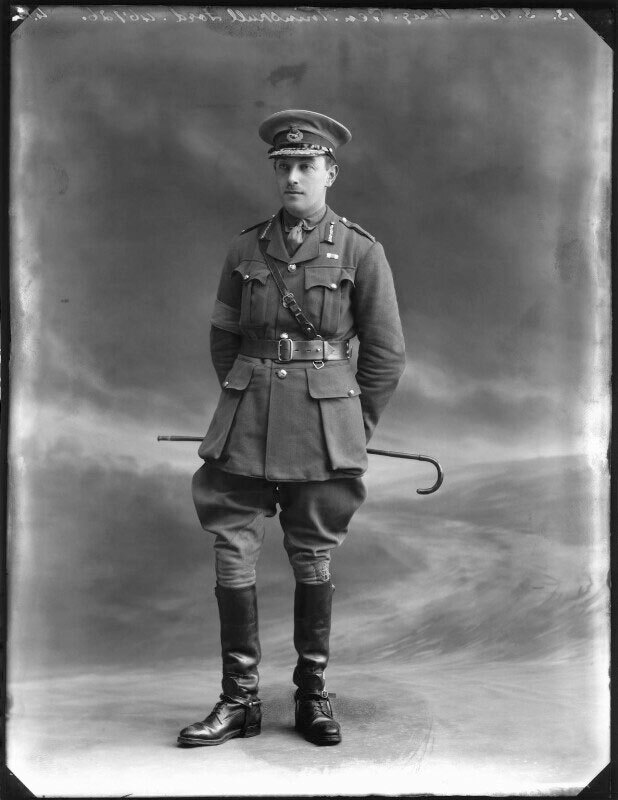 Major-General John Randle Minshull-Ford CB, DSO, MC. Born 12 May 1881 at the Pant-yr-Ochain, Flash, Nr Wrexham (Now a popular gastro pub!). He was the son of Captain Minshull-Ford JP. He was commissioned into the Regiment on the 11th August 1900. At the outbreak of WW1, he was Adjutant of 4 RWF and based at Wrexham. His battalion was deployed to France in early November and almost immediately on arrival at Le Havre on the 6th November he was sent to 1RWF with reinforcements to help rebuild the Battalion. With a few months of picking up the stone cannon ball at Ypres, Capt. Minshull Ford was commanding 1RWF; by 1916 he was commanding a fighting Brigade. He survived the war, and eventually retired from the Army in 1938 having attained the rank of a Major General. He was later appointed Lieutenant Governor and General Officer Commanding Guernsey and Alderney District. He arrived at St. Peter Port to begin his tour of duty with his wife and daughter on the 4th June 1940, two weeks later he escaped with his family on the last boat out of Guernsey, just before the German troops arrived. His request to remain with the people of the Channel Islands during their hour of need had been refused by London and he was ordered to evacuate. He was appointed Colonel of the Regiment in 1938 and served in this role until 1942. He died on the 1st Apr 1948. His medal group is held at the RWF Regimental Museum, Caernarfon Castle along with photo albums and other items from his military service. 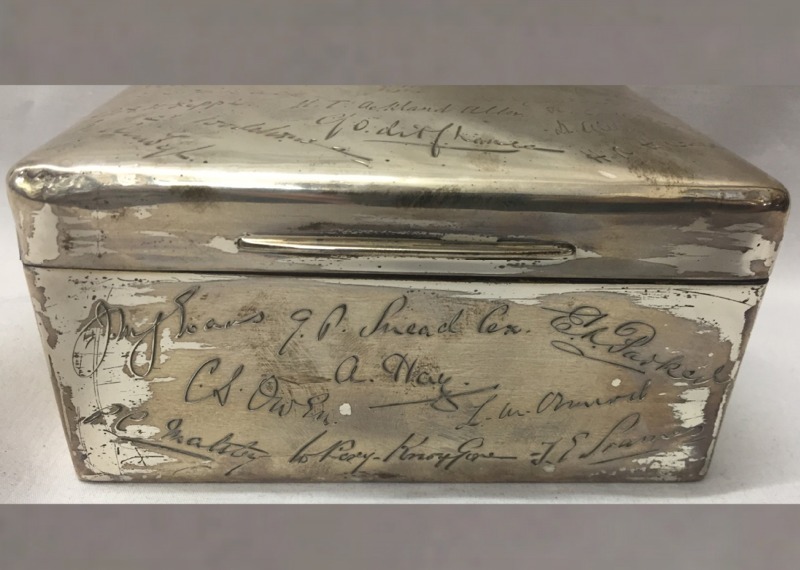 This beautiful silver box was commissioned by members of the 2nd Battalion Officers’ Mess to commemorate the meeting of the 1st and 2nd Battalions in Malta in March 1914. On St David’s Day 1914 the 1st Battalion, Royal Welch Fusiliers were stationed in Verdala Barracks, Malta. On 2 March the 2nd Battalion, homeward bound from India in HM Transport “DONGOLA”, arrived in the Grand Harbour at about 8am and disembarked the turnover to the 1st Battalion of 6 Sergeants and 327 rank and file. It was the first time the two battalions had met since 1880 and by the kindness of His Excellency Sir Leslie Rundle, Governor and Commander-in-Chief, it was arranged that the ship should be detained until midnight so that the officers of both battalions could celebrate St David’s Dinner together. 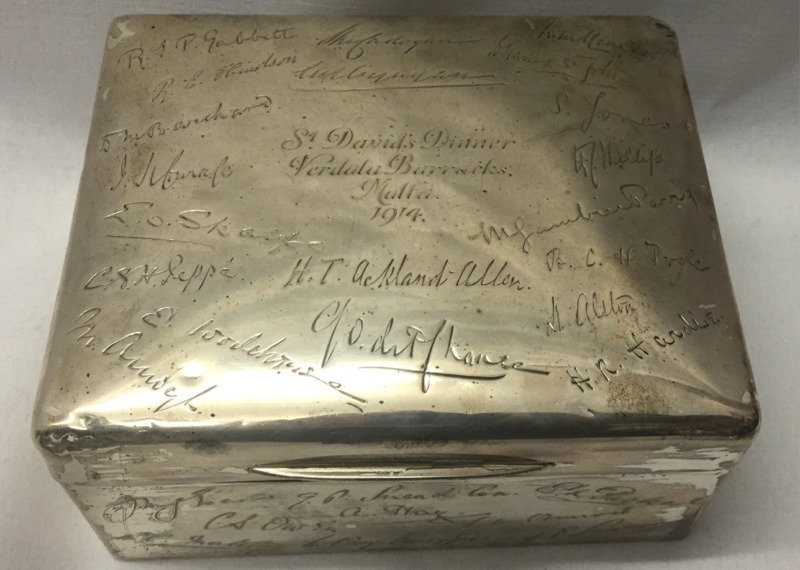 Of the 39 Officers whose signatures appear on the cigar box, 13 lost their lives during the Great War, 7 of them by Oct 30th 1914. Of the 23 Officers of the 1st Bn commemorated on the box, 6 had been killed in action or died of wounds and 12 had been wounded by the 30 October 1914.